Feedback & Assessment refers to a systematic process of collecting information and observing the knowledge, skills, attitudes, and beliefs to assess student learning and progress. 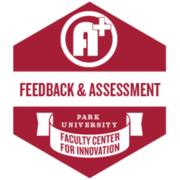 This badge represents focused faculty development to learn about how to create and develop effective strategies for providing feedback and assessment within a course or program. Recipient has learned about and implemented practices for Feedback & Assessment to the extent that she/he can influence the learning of others inside or outside the Park University community. He/she has shared their expertise on the topic of Feedback & Assessment in one or more Park-sponsored or FCI-sponsored events (such as presenting an FCI Innovation Exchange, creating an FCI “Two-Minute Mentor,” presenting at a Department, School, or College meeting, facilitating a session at the Annual Assessment Institute or a similar University-wide event).